The beer is also available in a few other delis around this section of the North Norfolk coast, which is both an AONB (which is celebrating the 50th anniversary of its designation this year) for much of it, and also the Distinctive Landscape which I wrote about for the OCR GCSE textbooks. Here's the brewery's promotional video. Take a look at this before reading on. Malt Coast Brewery from Malt Coast Brewery on Vimeo. A new brewery on the North Norfolk Coast, UK. Bracing seas, open skies and wild empty beaches. We grow our own award winning malting barley - total traceability from grain to glass. 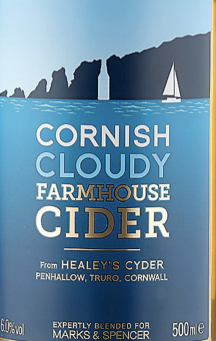 Looking at the beer and the way that it is marketed, the landscape is very much a part of the branding, but if one looks at many other beers, such as those which are sold by Marks and Spencer, the design of the label is tied closely to the drink. Here's an example, a Cornish cider brewed by Healey's. To return to the Malt Coast Brewery, look at how they market their beers. The designs are based on Norfolk's distinctive coastal landscape. I have in mind to put together a quiz on which distinctive landscape is being used for particular drinks, and see whether the students can identify the particular part of the country being represented. One final additional element to this story is that the Norfolk Coast is not just affected by local changes. It is connected to the rest of the world, and one connection is the EU funding that supports the brewery. This comes from the EU in the form of the European Agricultural Fund for Rural Development. This sort of area requires investment and support in the same way as sheep farms in the Lake District do.